Experience the intimacy of Dar Do with its splendid beige and chestnut colour theme and it's exquisite hand-painted ceilings. 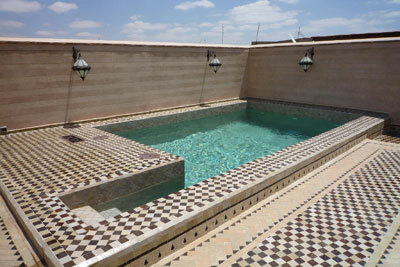 In the patio you have a mural fountain made of hand-cut tiles (Zellige) as well as two Moroccan-style living rooms facing each other. Five rooms are available, each richly decorated in their own personalized colour. Traditional “Marrachi" craftmanship creates a warm atmosphere: different coloured taddelakt, hand-woven rugs and hand-made furniture. Surrounded by the hubbub of the life in our district, the raised terrace protects you from would-be onlookers and offers you a panoramic 360° view over the medina and Atlas mountain chain. In the first nice days of spring or in the hottest hours of the summer, Dar Do boasts a superb swimming pool located on the terrace! On the basement floor, you have a hammam and massage parlour room which offer you relaxation and well-being after long walks in the hustle and bustle of the city.